London proudly hosts the world this fortnight and Team Maldives has arrived to compete in badminton, athletics and swimming. If the Maldives ever hosts the Olympics, the first sport sorted will obviously be beach volleyball. Beach volleyball is super popular in the Olympics and was the second fastest sell-out of tickets after Athletics. Lots of resorts offer great beach volleyball courts and many of the resorts sport quite competitive teams, but the Wembley of the beach volleyball circuit is on Paradise Island. The resort pitch includes lighting (for night games) and a sheltered (against sun or rain) seating area. The picture above was against Club Med (playing in yellow and blue) where there was quite a buzz with a crowd of both staff and guests. I made the quick switch from Maldives-trotter to flying over to New York to help with NBC’s Olympics coverage so I’m getting lots of beach volleyball, football, table tennis, field hockey and a dozen other sports on the go at any time. 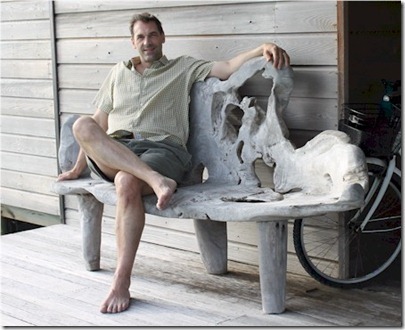 Gili Lankanfushi seems like is as designed by da Vinci. 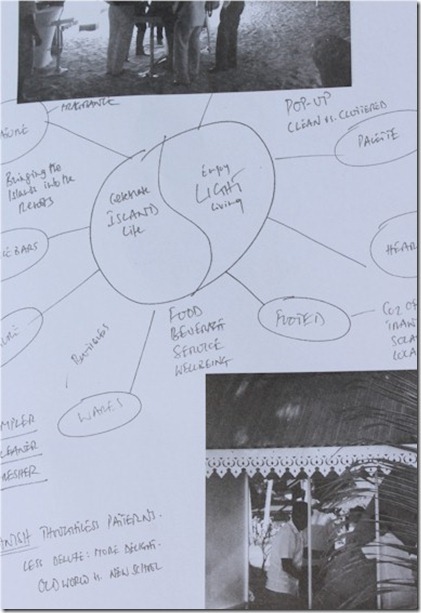 A Maldivian masterpiece with artistic flair and clever creativity, but at its core a pervading since of simplicity. That quality is what draws so many people to the Maldives and back again in the first place. A week or more of the simple island life. A plot of sand and a palm tree. What more do you need? And it all starts with no shoes. I mean, it literally all starts with no shoes. 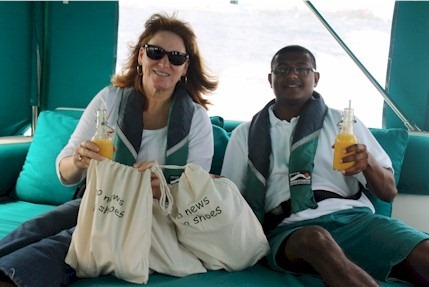 When the speed boat transfer welcomes you on board with its fresh juice in simple bottle, the very second briefing they do (after safety) is the ‘no shoes’ ritual. One of the great charms of the Maldives is the extent to which you can just go barefoot everywhere. The soft sand is not solely the domain of the turquoise seashore, but invades the reception, dining areas and pretty much every nook and cranny of the best resorts like Gili. On most of my Maldivian holidays, we take our shoes off when we get shown to our villa and we don’t retrieve them until it is time to check out. Gili delightfully ritualises this ethos by inviting guests to remove their shoes immediately right on the transfer boat. (see above) The boat captain explains the ‘No news, no shoes’ ambience of the resort and hands out special little canvas bags for you to put your shoes in (so the staff can take you shoes to your room with your luggage). It has all warm and inviting grace of an Asian home. I always feel a bit more intimately welcomed in a home where you are encouraged to take your shoes off. I don’t wear shoes around my own house, and when I take them off in someone else’s, it’s like I’m at home myself. It is a smart move by Gili because no matter how obvious it seems to walk around shoeless, the practice so extreme in Maldive resorts and a fair degree uncommon in posh resorts around the world, that we see many people not really getting the hang of it until well into their stay by which time they’ve lost a few days of barefoot bliss. I was intrigued to compare Gili with Mirihi which is a resort renowned for its simplicity as well and which I coincidentally also visited this tour. They are both stunning resorts made more so by this emphasis on no-nonsense naturalness. Curiously, they go about it from completely different directions. Gili is a big resort that simplifies by eschewing the little things; Mirihi is a little resort that simplifies by eschewing the big things. 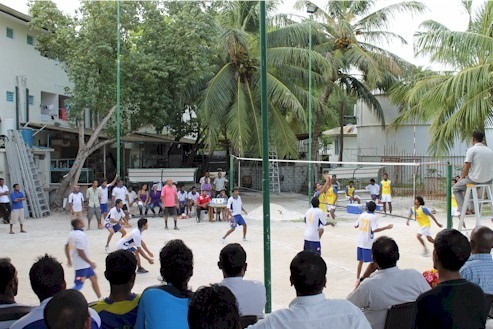 Mirihi has elected to avoid major items in their resort concept – TVs, pool, tennis courts. Gili simplifies by stripping away the little frills and trimmings. One of their big little touches is that they don’t garnish their drinks. No lemon slices stuck on ther side of the glass, no maraschino cherries with toothpicks in them, no little colourful parasols. All of the resort’s design reflects this approach of clean, straightforward, unadorned simplicity. The aesthetic cousin to simplicity is nature. And nature is just as fundamental to everything at Gili. The striking seating made of tree root (see below) are found everywhere. I was regularly struck by the innovative ways in which they were able to incorporate a natural approach. They have air conditioning in the bedrooms of their villas, but otherwise all other areas (bathroom, lounge) are all refreshed naturally in the open air (which works well since all of Gili’s villas are over water). Even the coat hangers in the closets are made from sticks and coconut hemp rope. Gili Lankanfushi exemplifies simple rustic elegance. The tour is done. Thankfully, we returned to England just in time a break in the 4 month downpour. The 27 degree, sunny days made the return transition less jarring. I’ve shared my daily initial impressions, and over the next week I will share in tour order some of my favourite ‘Best of the Maldives’ features that I uncovered. Not necessarily the biggest or most impressive ones, but ones that caught my fancy. 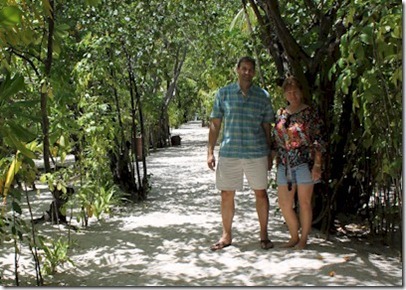 Before then, here are some parting overall reflections on the Maldives after our stay. Flights to Premium – The inexorable tide of stronger and stronger quality remains as unabated. It’s not just the refurbs that turn tired fun-in-sun style holiday resorts into showcase luxury experiences. Even the value resorts and 4-star properties are raising their game with slicker looks and offerings. Ambient Music – Finally, the majority of resorts we visited seem to have shifted their music selection in the bars and lounges to more appropriately relaxing playlists of gentle acoustic tracks (sometimes taken from the spa music library) or something like a soft jazz instead of the tiresome top 40 pop selections that have prevailed in the past. Weather – Another visit during the ‘monsoon’ season. The only two times that we felt the ‘monsoon’ (ie. bucketing down rain and very windy) was (a) while we were snorkelling at Vakarufalhi (underwater everything was fine), and (b) returning from our whale shark excursion (and we were all laughing at the dhoni wrestling with the bumpy seas). There were a few other passing Winnie the Pooh-esque ‘little black rain clouds’ who let loose a couple drops, but we barely felt them. The other dimension to ‘monsoon’ season is the breeze. Throughout the week there was near constant breeze. 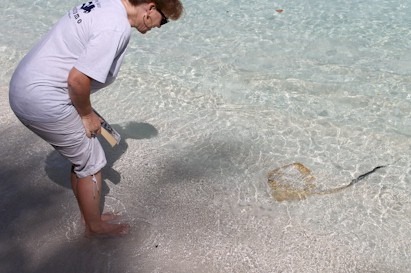 While this reduced the calmness of the water and the visibility underneath it (stirring up more sand than usual), Lori savoured the fresh breezes. Paradise Island – Nature interaction: Bats, birds (that land on your arm), a good snorkel meant we were doing our Dr. Doolittle thing for most of the stay. Vilamendhoo – Dessert: German Chocolate Cake. Very hard for resorts to get puddings right and baked goods never seem particularly fresh or more-ish, but this cake was an exception. Vakarufalhi – Snorkel: Complements of and compliments to effervescent marine biologist tour guide Tania. Mirihi – Dinner: Lobster with Champagne and Truffle sauce. 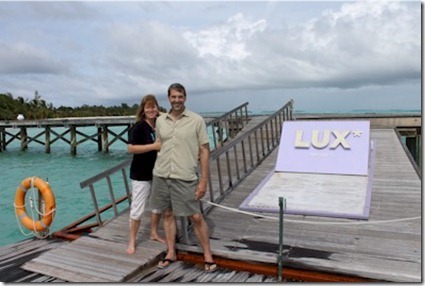 LUX* Maldives – Special touches: My obsession, LUX* Maldives’ promise, and they delivered. Sun Island – Shark feeding: I’m still of mixed mind of this controversial practice, but the event was quite impressive. Holiday Island – Value: Hope for the average tourist to experience paradise without winning the lottery. I made more friends and supporters, and gathered more insights and data for the database. But best of all was a first hand perspectives on 10 more wonderful Maldivian resorts so I could talk about them with more authority and perspective. So many decry the onslaught of the billionaire playground super-premium marque resorts into the Maldives. The Maldives veterans miss the days of straight forward thatched roof bungalows in the middle of paradise without a lot of fuss. Especially, if that fuss is going to drive the price up to prohibitive levels. Holiday Island has not gotten caught up with the latest trends in drench showers, over water spas and nouvelle cuisine restaurants. Most importantly, they remain part of the endangered species of resorts where you can get a week full board for under £1000. Many of the super premiums charge that per night. 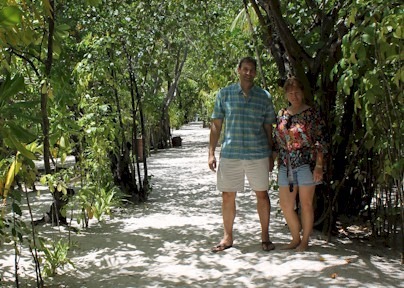 They also have set all of the villas and infrastructure behind natural greenery which means that from the beach or off-shore, the island looks like an undeveloped deserted island. The only hint of human activity is the boat jetty. As a result, walking around the island (a nightly sundown ritual for our family) or lounging on the beach provides a 100% natural vista. While I was visiting Sun Island, it seemed a shame not to drop in on Sun’s commercial and geographical sibling. I found that nostalgia and budget isn’t the only reason to consider Holiday Island. As with all of the Villa resorts, they have a resplendent Araamu Spa which sprawls across nearly an acre with big outdoor treatment areas and decorated with some of the most elaborate fountain-work in the Maldives. They also have not one but 2 golf simulators. Not large, but ‘grand’. Sun Island is the largest resort island by just about every metric. Largest acreage (for a dedicated resort island versus the multiple resorts on Gan and multiple tourist hotels on Male) and number of rooms to start. When it comes to infrastructure, there is about twice as much of everything. Four tennis courts, 4 table tennis tables, even 2 snooker tables (when it is rare to find a solitary one on a resort). The scale of the resort means that there is simply much more on offer that you don’t typically find on a resort island – a pharmacy, a small tourism college, a hyperbaric chamber, a dozen shops. Also, different outdoor areas feature unique areas – a bird sanctuary, a nature park, many gardens for growing fresh produce for the island. The whole resort has more of a ‘resort town’ feel to it. Sort of Martha’s Vineyard with palm tree. You get around on elegant black and red brick boulevards. And the staff facilities aren’t hidden away behind fenced off secluded areas, but instead the staff live in garden villas similar to those of the guests. Lori commented that it had an old world ‘grand’ charm. Like something out of a E.M. Forster novel. Instead of the outdoor reception with beach-style seating, Sun invites you into a lavish air conditioned room with rich drapes on the windows and plush sofas. Carrying on across the island, through the lantern lit, palm-lined avenues decorated a various turns with elaborate carved statues, the mystique carries on throughout . While the characteristic charm of the Maldives are the small islands, Sun shows that big can be beautiful. And I uncovered a big number of Best of the Maldives possibilities with 17 distinctions identified which makes it the 5th highest in the Maldives to date. In Maldivian paradise, every resort has the same soothing sun, turquoise waters, vibrant sea life, swaying palms, and romantic sunsets. Nowadays, most resorts have spruced up their rooms so that they are comfortable and slick. On the food front, it’s hard to go too far wrong with the endless supply of fresh seafood as well as the range of resort staples. 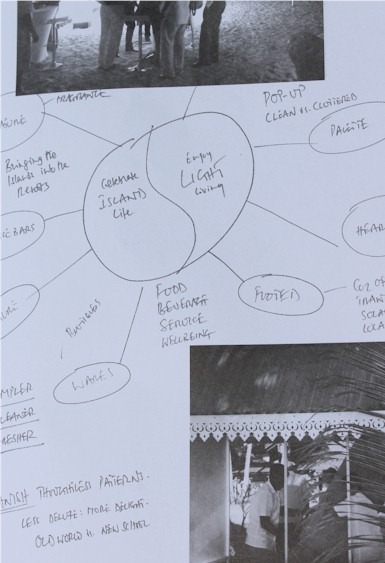 So where do you focus if you tick all the boxes and want to create a distinctive experience for guests? The people. That was my impression after a quick stop in Vakarufalhi. For a long time, Vakaru has been mostly an Italian resort, it is now extending its availability to other markets across Europe and beyond. It is another rare beast avoiding the siren call of the ‘5 star’ as it is sticking with its 4+ star positioning and value pricing. It is a modest sized island, neither extremely small nor very large, for those looking for a balance in size criteria. Vakaru didn’t have many showy features that stood out and yet I still found myself feeling that I would readily recommend staying here. On reflection, all of the little details that I most admired came back to certain people. 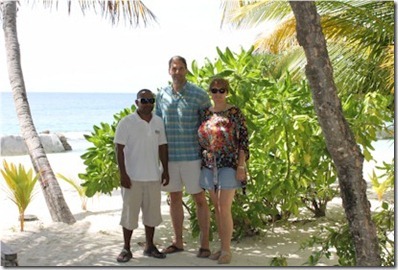 This is not an observation exclusive to Vakaru as I have met so many distinctive and impressive people in the past few days and all my time in the Maldives, but at Vakaru it was really fundamental aspect to the resort punching above its weight class. I was toured around by Maldivian veteran Abdulla Saeed who had one of the most extensive pedigrees I have come across in the Maldives. He uses his extensive experience to refine the experience for all the customers (like making sure that the Boduberu drumming doesn’t go on too long and having different welcome drinks for different times of the day). Rizzoli Riccardo is a top flight Italian chef with a personality as big as his repertoire who makes sure that every meal is as savoury as a Tuscan feast (yes, homemade fresh pasta and gelato…no matter how much you have stuffed into yourself from the tempting buffet, there is always room for gelato). Tania Gae Militello, the marine biologist, is the most passionate snorkel guide I have ever met. She runs daily, free excursions on the extensive house reef and seems to be on a first name basis with all of the aquatic residents there. And the General Manager is meticulous about constant improvement. He grilled me more than any other manager this trip on what could be better, what worked well, how did things compare. 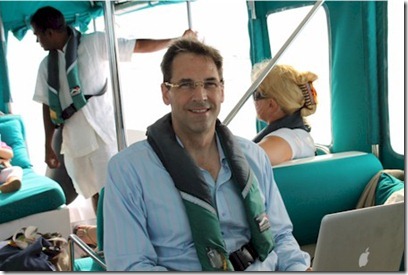 After settling into the role in his first year, it is clear that he is scheming a number of new ideas and enhancements to give the island even more appeal and distinction. An up and coming resort to keep an eye on. Mythical Mirihi of Maldivian Magic. I stepped off the transfer to Mirihi with the highest of expectations. Expectations built up from near frenetic fandom expressed in reviews and especially the TripAdvisor Forum. And the biggest compliment that I can pay them is that they met or exceeded those. The most common question I get asked by people interested in my Maldivian expertise is ‘Which is the best resort?’ My answer is always, “There is no ‘best resort’, only the ‘best’ for you.” There are resorts of every shape, size and style to suit every personality, preference and passion. But if someone twisted my arm, one of the ones that would come to mind is ‘Mirihi’’. And I hadn’t even visited there yet. It’s a champion on paper. Classic diminutive size. Affordable to mere mortals. Renowned house reef. Maldivian classic ‘feel’. What it really prides itself on are 4 aspects – Service, House Reef, Food, Ambience. Service – Normally, I poo-poo resort claims of exceptional service. 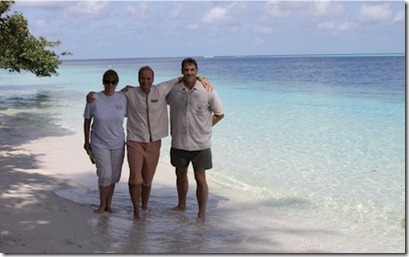 I find that that outstanding service is pretty pervasive in the Maldives. What I would say was distinctive were the smiles. Everyone had a big, bright, just short of laughing, sincere smile on their face. There is nothing like a smile to make one feel at ease. 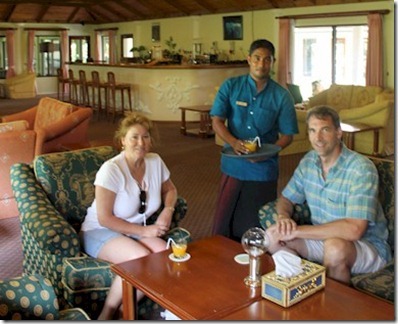 On a more pragmatic level, they claim that they have a very high staff/guest ratio (145 staff for 72 guest). Maybe not as concentrated as Jumeriah’s one butler per guest, but still heavily loaded for a non-super-premium property. House Reef. Wow. A stunner like the Joan Harris of house reefs – voluptuous, colourful, strong. A blockbuster like the War and Peace of house reefs – interminable, shades of dark and light, complex twists and turns. 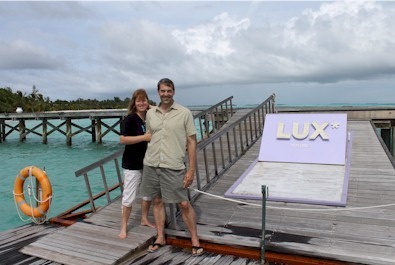 At the water villas, Lori described it as ‘house reef on your doorstep’. The minute you step off the deck ladder and poke your mask underwater, you are surrounded by coral and fish. When we finished our snorkelling, she just sat on the deck stairs for 20 minutes flirting with a curious wrasse. While most water villas in the Maldives are perched on lagoon ledges with relatively sparse coral, Mirihi’s are right in the thick of it. Adding to the drama is the relatively unique topology. Most house reefs either plunge to a vertical drop-off or stretch across a horizontal plateau. Much of Mirihi’s is on a gentle 45 degree slope giving the reef a bit of dimension as it descends. Then, the coral stops in the relative shallows (12 meters) and you have white sand which is nice because it creates a contrasting frame for spotting critters passing by deeper down. The reason the island itself is so small is because the house reef dominates so much of it. Lots of treats, but one feature that struck me was the most blue tipped branch coral I have seen, both in aggregate and in individual monster clusters. Food – Here was another area where I am quite discriminating. I like my food. I’m not so much a snob that everything has to be nouvelle cuisine fussiness. But I will distinguish between a ‘yummy’ and ‘wow’. For most resorts producing food on a large scale, just getting the majority of dishes to the ‘yummy’ level is quite a trick. I was duly impressed that everything I ate was ‘yummy’ (even ‘scrummy’) and there were a few ‘wows’ thrown in as well (notably their Lobster Dinner, more on that later). Ambience – Mirihi is not perfect. The biggest and deliberate shortcoming, is the extent of infrastructure. Most prominently, no pool, but also no tennis court and limited other land sports and activities. And, shock, horror – no TV (except for one TV in the lounge for special events). But Mirihi has flipped this possible shortcoming into an advantage. They strive for a very simple minimalist ambience. Focus is on the experience, not the infrastructure. What they call ‘soft factors’. Any fighter (weight class), racing driver (engine class) or school athlete (age class) will tell you that the key is being best in class. Vilamendhoo makes a serious bid for the best 4 star in the Maldives. Leading contenders before for me were Kuramathi and Komandoo, but both of those have joined the inexorably rising premium tide and have re-positioned themselves in the increasingly crowded 5-star category. Despite a sparkling, top-to-bottom revamp, ‘Vila’ has stuck to its 4-star designation. The value extends beyond the room prices as all of the resort prices are reasonable. For example, their lobster dinner on the beach is only $60 (£37). While Vilamendhoo has joined the herd stampeding to ever higher standards in the Maldives, it has broken away from the pack, part of a rare breed of superb 4-star properties there. The 4-star move is a smart one for customer delight. Rather than be yet another 5-star, it stands out as a 4-star. The key to customer satisfaction is exceeding expectations. And anyone coming to Vila expecting a 4-star resort is going to have their expectations exceeded. Everything is at least 4-star quality or better. And they have splurged on some typically 5-star touches like drench showers and an overwater spa. Lori and I have stayed in the poshest of posh hotels and are pretty fussy with our dining and sleeping, and we would be very comfortable and happy spending a long visit at Vila. I identified a further 6 Best of the Maldives candidates during our stay to be posted over the next few months. Quality and value aren’t the only areas where Vila straddles having your cake and eating it. It also deftly hedges the raging ‘children’ debate (some love Maldives as a great destination for the family, while others prize the tranquillity that they fear children disrupt) by offering two areas – one welcoming children and the other exclusive to adults only. This solution is as effective as it is diplomatic. Visiting both pools, both bars, and both restaurants, they did each have a different vibe. And that is great…different strokes for different folks. The thing that you have to keep in mind about the Maldives (and this is the root cause some perceived ratings inflation) is that the destination itself is a 6-star destination. You could put a cardboard box on the beach and it would still be close to a 5-star experience compared to many places in the world. In this context, Vila is a bit like Hagen Daz vanilla ice cream. It’s not particularly fancy with all sorts of elaborate gourmet mix-ins. Just sumptuous, delicious ice cream. Again, the Maldives – the waters, the reefs, the sunset, the palm trees – are like the best pie you have ever eaten. The resort is just the scoop of ice cream on top. And Vilamendhoo is a simply superb complement to such a tasty dish of paradise. Post Script – The little tan blob in the right hand corner of the picture above (for the eagle eyed) was a sting ray passing by during our photo. Below Lori says a closer hello.